It’s that time of year again….spring cleaning! Call me crazy, but I love it! There is something so satisfying about getting my home looking and feeling fresh and clean. Yes, it takes a little elbow grease, but it’s worth it in the end. One of the biggest jobs on my to-do list is cleaning my kitchen. It’s the heart of our home and is also the room that tends to need the most TLC. It can take hours (or sometimes days) to finish, but if you get organized and have a plan, it will be much easier to manage the many tasks required to get the job done. 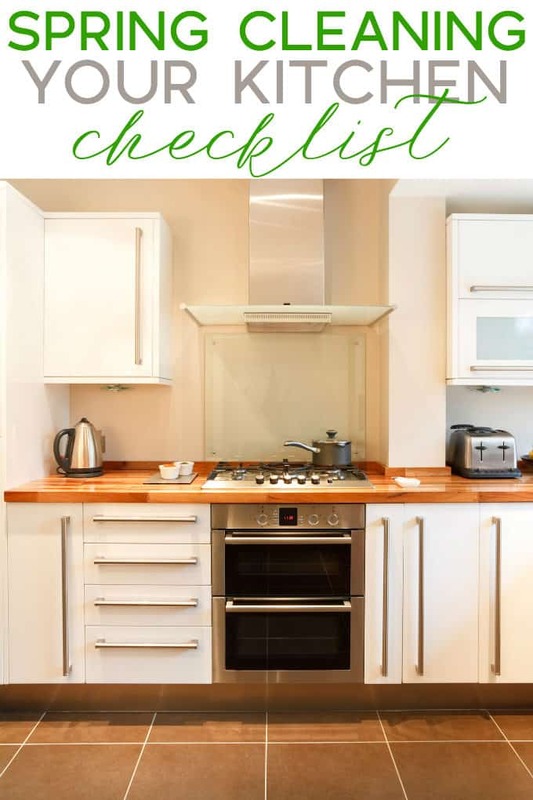 To help get you motivated and organized, I’ve developed a Spring Cleaning Your Kitchen Checklist and I’ve even made a free printable version for you! Print it out and put it on your fridge and then you can check each item off your list as you finish the task. I promise all your hard work will pay off in the end. Your kitchen will never look better! So where do you start? Let’s break it down into smaller tasks and get to work! 1. Clean your dishwasher. It’s one of the hardest working appliances in our home, yet it’s often neglected when it comes to cleaning. Did you know that only 27% of Canadians have cleaned the inside of their dishwasher in the last 12 months? Don’t be part of that statistic – it’s super easy to clean your dishwasher when you have the right tools! 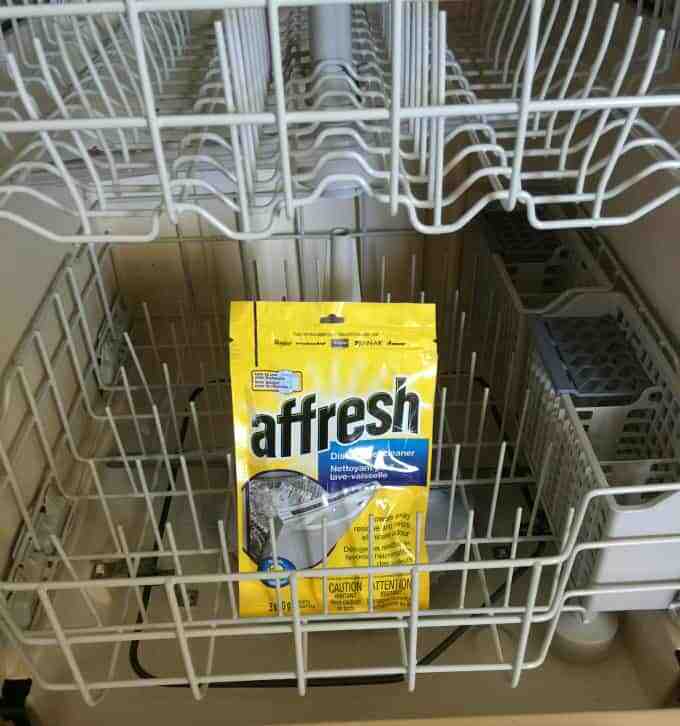 I recommend using affresh Dishwasher cleaner to keep your machine working its best. It powers away residue, including hard water and mineral deposits, and gets rid of any lingering odours. Just pop a tablet into your detergent tray and start a normal wash cycle. It’s even safe to use while you wash your dishes! Look for affresh products at your local grocery store. 2. Clean your oven. This is the one job I hate to do, but I know it needs to be done. I’m not a big fan of the harsh oven cleaners, but if you do use them, make sure you wear gloves. There are also natural ways you can clean your oven. 3. Clean your stovetop. I have to do this task regularly because I’m always spilling food on the burners and that will set off my smoke alarm. Get rid of any accumulated grease or food with these easy cleaning hacks. 4. Wipe out your sink. A popular cleaning course online suggests cleaning out your sink every night before you go to bed. Use your favourite household cleanser and get that sink sparkling. 5. Clear your counters. If you are like me, your kitchen counters can end up being a popular spot where everyone puts their junk. Find a home for everything that doesn’t belong and clear out some space. You’ll have more room to work in the kitchen! 6. Clean your refrigerator. Try my four step system to clean and organize your fridge. You’ll have more room to put in new groceries and it will smell a million times better. No more rotting fruit or veggies hidden in the back! 7. Clean your freezer. I’m pretty good about cleaning the fridge, but I always forget to do the freezer. Don’t be like me. Get rid of any freezer burnt food and make room for new items. 8. Organize your pantry. It’s true. A cluttered pantry will make you spend more money than you need to. Try my pantry organizing tips so you can find items when you need them. 9. Clean your microwave. The easiest way to clean your microwave is to fill a bowl with hot water and add some lemon juice and vinegar. Microwave for 5 minutes and then let it sit inside for a few minutes. Remove the bowl and wipe out any stuck on residue. It should come off easily. 10. Clean your windows and window coverings. You’ll be able to see the beautiful spring weather outside better and get rid of any dirt that has accumulated over the winter. 11. Wash the floor. You probably already do this job regularly, but I think it’s still important to add to our kitchen cleaning list. 12. Wipe down the baseboards. My mom notices dirty baseboards when she comes into a room. I’m bad for cleaning them so I tend to only do it a few times a year (eek!). I like to use disposable cleaning wipes to quickly get it done. Now that the weather is nicer, I’ve started my spring cleaning. I’m getting my kitchen done first because it’s the biggest job. You might also like to know these Dishwasher Do’s and Don’ts, oven cleaning hacks or how to keep clutter off your counters. 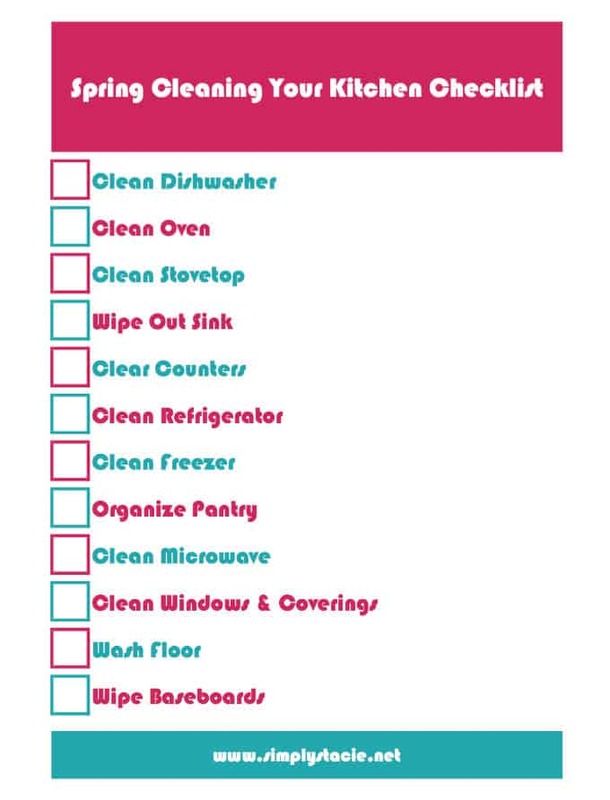 Fill out the form below to get your Spring Cleaning Your Kitchen Checklist delivered to your inbox. Yes I have definitely started spring cleaning. Washing curtains, washing walls, painting. Yes I have started my spring cleaning yesterday! Yes, I started cleaning my backyard. I did start and then i was delayed with yard work and need to get back to it again. I’ve started changing out the kids winter clothing for summer stuff. But, I have lots more to do on my spring cleaning list. Yes, I’ve been slowly getting through each room. Not yet. I am waiting for the weather to get warmer so I can open all my windows while I clean. I have started a little bit, but I’m waiting to do the bulk of it when the weather is a little nicer! I could sure use this dishwasher cleaner…I have never cleaned ours in the 18 months we’ve lived in our apartment. Yes, I did last Saturday. I took down all my light shades and washed them all. Yes i have started,but I have been spending more time outside planting my flower garden.Have only had planters for the past 10 years,so I am very excited to create my own outdoor space! I’ve started, it seems like it never ends. Yes , I have almost finished with my spring cleaning- just have the oven to clean still. I have not started spring cleaning yet. I really have to!! Spring cleaning is all done! I have done some work inside and out. We live in an area that is prone to flooding, if there is a lot of snow or rain. I didn’t think it would flood this year, but it did and I had a lot of stuff, that floated in with the strong winds, to clean up. That is done, but today it the water is over the banks again. We have had a lot of rain in the last two days. Now I will have to do it again. I also had to deal with a few minor wet spots in the crawl space. I have done a bit of cleaning inside, but there is lots left to do. Thanks for the giveaway. No I have not had the energy for any spring cleaning. I think it is time to hire a maid. I just started spring cleaning. It’s going rather slow. No not at all. I am being completely lazy about it.. It is such a big task. I’m about half way through, so I’ve checked off a few rooms. No I have been out of town for a month so when I get home in 2 weeks I will be cleaning like crazy. Yes, I have started my spring cleaning already. I love to get an early start, so that by the time the sunny weather is here I can spend my time outside instead of inside cleaning. We have a big to-do list and I try to knock off quite a few tasks each week. Last weekend we cleaned the outside of all our kitchen cupboards – they were so greasy from the kids!! We’ve also done the counters and fridge/freezer clean out. Next up is the dishwasher, then floors, then oven. Yes, I have started doing a bit each week! Not yet ! I have to take a week off work soon to get it done ! I have just started. I really hate it. Yes, I have started my spring cleaning and I hate every minute of it!!! I started my spring cleaning, but haven’t finished it yet. I am methodically going through all my kitchen cupboards, purging and organizing. I’ve hired someone to come this weekend to clean all my windows. Since we have a two story house I’m am really glad that my husband doesn’t have to climb up ladders this year. Yes, I have completed a lot of my spring cleaning but still have a bit to go. Yes, I have started my spring cleaning. Yes, I have started Spring cleaning. Getting rid of lots of junk as I go. I Spring clean all year long! Cleaning is in progress for spring and in another month it will be time to start summer cleaning! I keep putting off our spring cleaning. All I want to do lately is sleep, but I swear I’ll get around to it soon!! We did a nice deep cleaning inside and out!! Yes; like you,, I feel that cleaning my Kitchen is the most important and biggest cleaning job of spring cleaning. I am so happy to have it done. Nope, not yet. I am hoping to get started next week. Yes I’ve started my spring cleaning started with everyone’s closets to get rid of the winter items and put in the spring items. Will be moving from room to room every week to get done before the kids are finished with school.